Steven Tyler is featured in a pair of new commercials for the Kia Stinger GT, and the ads are streaming online ahead of their broadcast on Super Bowl 52 on February 4. 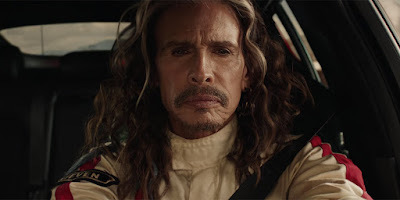 As the haunting notes of Aerosmith’s 1973 classic, "Dream On", play backwards, two-time Formula One and Indianapolis 500 champion Emerson Fittipaldi looks on approvingly as Tyler approaches a Kia Stinger on an abandoned racetrack. Once inside, the Stinger GT's twin-turbo, 365-horsepower engine is put to use – in reverse – sending Tyler on a transformative journey back to the seventies. Designed in Frankfurt and developed on Germany's famed Nürburgring racetrack, the Stinger is unlike anything seen before from Kia. Recently named "Vehicle of the Year" by Roadshow by CNET and available in both rear- and all-wheel-drive, the Stinger GT, with its twin-turbo V6, pushes the sports sedan to a top speed of 167 miles per hour and from zero to 60 miles per hour in 4.7 seconds. Entitled “Feel Something Again” and accompainied by the tagline, “Fueled By Youth,” the Kia ads starring Tyler will air during NBC-TV’s coverage of the third quarter of Super Bowl 52, which will see the defending NFL champions – the New England Patriots – take on the Philadelphia Eagles at U.S. Bank Stadium in Minneapolis, MN on Sunday, February 4. Tyler’s Aerosmith bandmate Joe Perry performed alongside an all-star lineup at the sold-out record release show for his new solo album, “Sweetzerland Manifesto”, at The Roxy Theatre in Los Angeles on January 16. Perry and his makeshift band – including members of Stone Temple Pilots, Extreme’s Gary Cherone, Robin Zander of Cheap Trick and vocalists Terry Reid and David Johansen – were joined by special guests Slash, Johnny Depp and former Black Crowes frontman Chris Robinson for an 18-song set of Aerosmith classics, covers and tracks from Perry’s latest solo project.